The PowerScan 8000 product series is Datalogic Scanning's premium line of rugged industrial handheld data collection products. 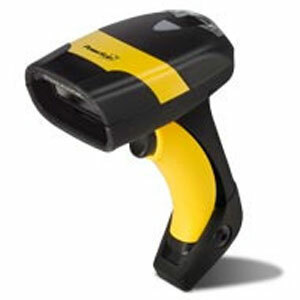 The PowerScan PD8300 laser scanner offers state-of-the-art performance in a corded industrial product. The PD8300 reader features Datalogic's exclusive 3 Green Lights (3GL™) for superior good read feedback. The patented ‘Green Spot' directly on the code, and dual Good Read LEDs on the top and back of the cap add increased visibility at any angle. Superior reading performance is enhanced by Datalogic's patented PuzzleSolver™ technology for fast and accurate reading of standard, poorly printed and damaged codes. The PD8300 reader's mechanics have been developed and tested to withstand extreme environmental conditions maintaining consistent reading performance without degrading performance or reliability. Its ergonomic enclosure is lightweight and well-balanced to ensure optimal operator comfort during scan intensive operations. A built-in metal tether hook for suspended applications ensures workplace productivity.